On March 13, 2019, I presented the 2019 Digital Accessibility Legal Update to a packed house at the annual CSUN Assistive Technology Conference. I have been attending the conference since 2000, and presenting the Update for over a decade. With so much content, and no recordings, I try to follow up the powerpoint with a post like this one — summarizing this year’s updates with links to more information for those who are curious. And since it took me a month to get this out, there are even two new items in this post that were not part of the update. Please remember that this is an update. It is not a full analysis of the digital accessibility legal space. (It is also not legal advice!) I recommend reading this post in conjunction with the 2018 post-CSUN Legal Update for a more complete picture. I will next be offering the Digital Accessibility Legal Update in Austin during the John Slatin AccessU Conference, and in Dallas at the annual ADA Symposium. Check out the Speaking Page of this website for more details on these and other presentations. I also offer versions of the legal update for private organizations. Please contact me if you are interested in a digital accessibility legal update tailored to your industry. .
View the powerpoint used during the presentation. This year’s presentation was organized around Questions and Answers, as is this post. In only 40 minutes we had to go fast – I’m grateful to Level Access for providing the space for it! Why is the Law Part of Digital Accessibility? Why is Digital Accessibility a Civil Right? Where Does the Law Belong in Digital Accessibility? What are the Laws that Support Digital Accessibility? What about ADA Website Regulations? How Does WCAG Fit In? What is New in the Digital Accessibility Legal Space? What’s New from the Federal Courts? What’s New From the Courts Since CSUN? What’s New in Digital Accessibility Settlements? What’s Up Next in the Digital Accessibility Legal Space? I always start any talk about the digital accessibility legal space with this reminder: Digital accessibility is a civil right and a human right of disabled people around the globe. We know that digital accessibility is good for many things — improved SEO, brand differentiation, more customers to help the bottom line, essential for some but useful for all (think captions in a noisy room; better contrast that is easier for seniors). Yet the law is not involved in accessibility for these reasons. It’s involved because accessibility is a civil right of people with disabilities. Accessibility is a civil right because without it, disabled people are excluded from every aspect of society. In the 21st century, accessibility is about participation — in the economy, the workforce, social life, health care, and on and on. Accessibility is also a civil right because without it, disabled people lack privacy and security. Having to ask for help because a website, mobile app, or kiosk is inaccessible means security is compromised. I use the picture of an “ingestible” that is illustrating this post to drive home this point. 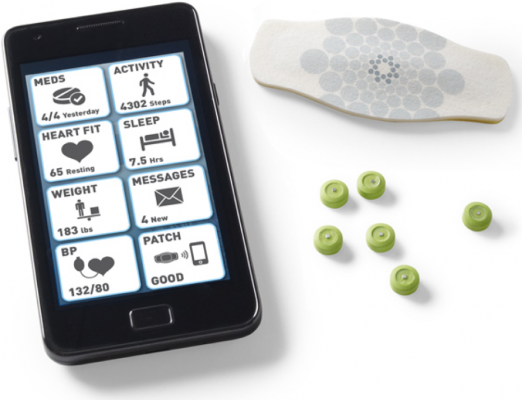 An ingestible is a tiny piece of technology that when swallowed, sends data through a skin patch to a mobile application. Imagine – information about your own body being sent to a mobile app you can’t read because it was not designed with accessibility in mind. While the privacy implications may not be as extreme with other apps, privacy is always a factor in accessibility. Medical records, credit card information, library choices, course work, dating preferences, and more. People with disabilities have a right to privacy which depends on accessibility. Accessibility is a civil right because without it the right to information is compromised. Information about voting, retail sales, financial, health, and family history records. We live in an information age. Accessibility makes information available to everyone. And accessibility is a civil / human right because it is about physical safety. My slide showing a talking prescription label drives this home. Without talking labels, pharmacies hand blind people an unlabeled container. With talking prescription labels, something I’ve worked on with the blind community in Structured Negotiation for many years, crucial safety information becomes accessible. Available to everyone. Read more about the Blick court order. Anyone who has heard me talk in the past couple years knows that I believe that I like to think of accessibility as a yummy cookie comprised of many ingredients. By which I mean that yes, compliance and the law are one aspect of a robust accessibility policy, one ingredient in the cookie. But certainly not the only one. Accessible coding, inclusive design, hiring disabled employees, transparency are also ingredients. The cookie recipe and presentation was developed for a panel at the CSUN 2018 conference that I co-presented with Sue Boyd, Assistant General Counsel at Microsoft. Read more about the recipe for staying ahead of the legal curve. Accessibility is global. But nowhere in the world does the law and compliance have such an outsized role in accessibility conversation than in the United States. The cookies illustrating this post, with the handwritten index cards reading “Bake Accessibility into your Organization” were baked in New Zealand by a participant in an accessibility workshop sponsored by the Blind Foundation of New Zealand. Just like putting too much salt (or even sugar) in a batch of cookies, putting too much law into an accessibility program leads to problems. One of those problems is what I call the 65% problem. As I told the CSUN participants, I was once asked during a webinar if captions which are 65% accurate comply with the law. People laugh, but I know the question was earnest. It’s the kind of question that arises when there is too much focus on the law, not enough focus on the people the law is designed for. Not enough focus on the people with disabilities whose advocacy made that law possible. Read more about the 65% problem and how to avoid it. While the United States legal foundation for accessibility is strong, the surge in web accessibility lawsuits by lawyers not committed to the civil rights aspects of accessibility has brought backlash. One form of that backlash is state laws limiting lawsuits about digital accessibility. States with such laws include Texas, Oklahoma, and Arizona. A bill in the Virginia state legislature is currently pending. There was no time to dive into laws around the globe recognizing digital accessibility as a human and civil right. But checking out the UN Convention on the Rights of Persons with Disabilities, and the Law and Policy page on the Web Accessibility Initiative website can get you started. My post on this website titled Digital Accessibility Laws Around the Globe also has relevant information about international requirements. One thing I didn’t say during the session — because I didn’t know it — was that it is likely that Domino’s will try to get the United States Supreme Court to hear the case. This news was reported by Seyfarth Shaw in its ADA Title III blog on March 21. In other words, the ADA violation is failing to effectively communicate website content. When that failure happens, WCAG compliance (either WCAG 2.0 or WCAG 2.1) can be ordered by the court. One thing that is new of course is the large number of web accessibility lawsuits being filed. The number jumped from 57 in 2015 to 2285 in 2018. (My thoughts about why there are so many lawsuits will be shared in a companion post to this one.) Most cases are settled, and the relatively small number of court decisions are based on early skirmishes. In those, defendants are mostly losing. This is why I still think, as I have for the past few years, that money is better spent remediating access barriers and developing a sustainable access program than fighting lawsuits. Domino’s Pizza Case: In a big win for digital accessibility in the legal space, the Ninth Circuit in January of this year refused to throw the Domino’s case out of court in its January 2019 order. The case challenges both the company’s website and mobile application; this is one of the first court orders saying that claims about inaccessible mobile apps can stay in court. But as mentioned above, now there is talk of the case possibly going to the United States Supreme Court. With the current composition of the court, this could spell disaster for people who care about an inclusive digital space. The shared feelings of many of us in the digital accessibility legal space about the nature of many lawsuits being filed and the small handful of lawyers filing them does not make the prospect of a Supreme Court ruling any more comforting. GNC Case throwing out company expert Last August the plaintiff in a website accessibility case filed in federal court in Florida won an important early ruling in the case. One of the reasons for the win was the judge’s conclusion that the company’s expert didn’t know enough about web accessibility to be an expert. The lesson? If your organization needs digital accessibility expertise, whether as a result of a lawsuit or generally, treat that need as you would any other organizational imperative: interview at least two, preferably three possible sources of expertise. Ask hard questions (and research the questions to ask). Chose someone that fits with your organizational goals, culture and budget. In other words, Don’t make the mistake that GNC did. Read the Court’s decision in the GNC case. Arbitration clause that’s not accessible doesn’t affect blind people. In December 2018 the US Court of Appeals for the 1st Circuit ruled that a blind person cannot be forced to bring claims in arbitration instead of court if the arbitration language was not effectively communicated. In the case against the Container Stores, the language requiring arbitration was presented visually on a flat screen point of sale device and was not read to the customer. Bottom line? Without accessible content, the arbitration clause didn’t count. The plaintiffs will have their day in court. Read the court’s decision in the Container Store case. Court throws out case because plaintiff lacked standing. The last new court order discussed during the update was an opinion by the US Court of Appeals for the 4th Circuit in a web accessibility case against the Department of Labor Federal Credit Union (DoLFCU). The Credit Union is a financial institution only for employees of the US Department of Labor and their families. Yet according to the court, the plaintiff was “not eligible for membership in the Credit Union. He does not work for the Department of Labor and never has in the past. No one in his immediate family has ever worked for the Department of Labor, nor has any member of his household. He makes no allegation in his complaint that he is legally permitted to make use of the Credit Union’s benefits.” The court threw the case out because the plaintiff, a blind screen reader user, did not have “standing.” Read the court order in the Griffin vs. DoLFCU case. I chose the picture here — swimmers standing on their hands underwater, legs sticking out of the water, to illustrate the ways in which this and other opportunistic lawsuits make a mockery of legal principles like standing. I think this was the correct result. Unfounded cases like this have resulted in tremendous backlash against the legal right to digital accessibility. Fueled primarily by lawsuits filed by people who could not join the credit union they sued, the Credit Union National Association is on a national campaign to limit the legal rights of blind people to enforce the ADA in the digital space through lawsuits. This hurts legitimate cases, credit union members and potential members who are disabled, and casts a pall over civil rights digital lawsuits. A better approach to the lack of access in credit unions is to try collaboration with members or people with the ability to come members. This happened last June when the NFB approached the BECU Credit Union in Washington State, resulting in a strong accessibility commitment by the credit union – no lawsuit needed. Read the Seattle Times article about the BECU accessibility initiative. The biggest case news since CSUN is the March 28, 2019 Court order in NAD v. Harvard University. This dense 29 page order is but the latest in the long running battle about the extent to which a university is required to caption its online video content. In my Spring 2016 Digital Accessibility Legal Update I wrote about an earlier ruling in the case refusing to throw the case out of court. A lawyer for the plaintiffs was quoted in the Inside Higher Education article about the Harvard case saying that the content the judge said couldn’t be sued about was “a tiny amount of the material that we have been looking to have captioned.” Read the April 8, 2019 Inside Higher Education article about the Harvard case. There is a case against MIT winding its way through the same court on the very same issues (video captioning of MIT content). The court issued a short order on the same day as the Harvard decision saying the same reasoning applied to MIT. Rather than continue with their aggressive litigation strategy, I hope these Universities will now stop spending money fighting to limit higher education captioning. The March 2019 court order is primarily a big win for the plaintiffs as it keeps almost all the claims legally viable, especially the ADA and Section 504 claims. I hope it gets everyone to the negotiating table. Most digital accessibility lawsuits (like all lawsuits) settle. Some settle after expensive fighting, some, in Structured Negotiation, with no lawsuit at all, or with collaboration beginning quickly after a lawsuit is filed. Settlements may not create legal precedent, but as I write in my book, digital accessibility settlements have long created industry precedent — paving the way for others to follow what settling parties have done. Unfortunately, the vast majority of web cases filed since 2016 are settled under a cloak of confidentiality. This lack of transparency is particularly troubling when cases are filed as class actions and settled with companies, universities, government agencies, and other organizations that serve the general public. A voting case against Alameda County California brought by blind voters was the first settlement in the country to use WCAG 2.1 as the accessibility standard. A voting case against the state of New York was settled in February 2019 with a commitment to provide voting information and digital absentee ballots in accessible formats. Read the press announcement and settlement agreement in the New York voting case. In February 2019 a settlement was announced in a law suit brought by a blind employee of the Miami-Dade County Public School system. Under the settlement, the district agreed to make its website and employee software accessible. Read the announcement of the settlement with Miami-Dade school district. In November 2018 the United States Department of Transportation (DOT) announced a settlement with Scandinavian Airlines (SAS). Airline websites are not covered by the Americans with Disabilities Act, but by a separate law called the Air Carriers Access Act (ACAA). The ACAA requires that airline websites meet WCAG 2.0 standards. SAS put up a separate website that met the WCAG success criteria, but the DOT found that a separate site was not an equal site. In the settlement, which was reached to avoid litigation, SAS accepted a $200,000.00 fine and agreed to make its main website accessible. Read the DOT / SAS web accessibility settlement. Here’s what I think we should be watching for in terms of cases and issues in the digital accessibility legal space. On October 4, 2018 the Court of Appeals for the 11th Circuit heard the oral argument in Winn-Dixie’s appeal of the judge’s order. We can expect the court’s written opinion any day. In May of 2018 a lawsuit against the DOE was filed by the National Federation of the Blind, the Council of Parent Attorneys and Advocates, and the National Association for the Advancement of Colored People challenging how the Department changed its rules about these so-call “mass filer” cases. Read the New York Times article about the case. The Department has since changed its rules again, reopening the web access cases it had dismissed with the first rule change, but the lawsuit is still pending. Stay tuned. The Harvard + MIT captioning cases were on my cases to watch list during the early March conference. On March 28 the next installment of this fiercely litigated case arrived in the form of the 29 page court order in NAD v. Harvard discussed above. Epic (medical records) inaccessible to blind employees: In January 2019 the National Federation of the Blind filed a lawsuit against Epic Systems Corp for failing to make its healthcare software accessible to healthcare workers who are blind and use screen readers. The suit is pending in federal court in Massachusetts. The lawsuit was a follow-up to an administrative complaint filed with the Massachusetts Commission against Discrimination in July 2018 against Epic. This case is important as medical facilities across the country use Epic software. Accessibility is critical to employment in the 21st century workforce. I anticipate more lawsuits about inaccessible employment technology. As with customer-facing technology, it makes sense to spend money purchasing and developing accessible workplace technology for employees and applicants, instead of waiting for a lawsuit and being forced to spend money on lawyers. Walmart Kiosk case: In October 2018 two blind Walmart shoppers and the National Federation of the Blind sued Walmart over the retail giant’s inaccessible self-checkout kiosks. In a case that shines a bright light on how accessibility and security are intertwined, the case arose when the shoppers needed help to use the inaccessible kiosk. Instead of helping, the Walmart worker stole their money. I’ve written about how digital accessibility is more than websites and mobile apps, and that the law is starting to pay attention to kiosk accessibility . That January 2018 post has been updated with news about the new kiosk case. You can also read the press release about the Walmart self-check kiosk case. Domino’s Pizza: In my cases to watch list there was one case I didn’t mention and should have: whether the Domino’s Pizza case would be taken up by the United States Supreme Court. As mentioned above, it looks likely that Domino’s will try to get the US Supreme Court to hear the case. The main issue would be whether plaintiffs can bring ADA lawsuits about digital accessibility barriers even though there are no DOJ regulations. Most courts in the country have said that the ADA covers websites despite the absence of regulations. News of the Supreme Court possibility was reported by Seyfarth Shaw in its ADA Title III blog on March 21. Now that I’ve read the recent court order in the Harvard captioning case I have to add that now I anticipate plenty of discussion, if not court skirmishes, about the Communications Decency Act. My feeling? Decency is having content that everyone can consume. Decency is recognizing that everyone deserves access to the digital world. This is a post about laws and cases about the rights of disabled people to be part of the digital world. Every year Lainey Feingold does a talk at the CSUN conference about what’s new in the legal world. This post described what Lainey talked about. Digital access means people with disabilities can read, use, and interact with technology. Access is a civil right of disabled people. In the past year many things happened in the legal space. A blind person won a lawsuit against Domino’s because the company’s website and mobile app didn’t work for blind people. Domino’s might ask the United States Supreme Court to hear the case and change the decision. In another case, a judge said the ADA applies to most of the online videos at Harvard. Harvard should caption all the videos so deaf people can understand what is being said. The court hasn’t decided that part yet. Blind voters in California and in New York settled lawsuits to make voting information and ballots accessible to everyone. In another case, an airline had to pay $200,000.00 because it made a separate website for disabled people. Separate is not equal. The main website should have worked for everyone.